Combine your beach visit with some cave exploration at Matala beach, where the landscape features a rocky plateau that appears to be sliding into the sea. Climb up to access some of the caves, cut into the side of the sliding rock by the water over the years. There is one particularly large cave over the sea, and swimmers often paddle to its mouth to inspect the inside. Cafes, restaurants, and shops line the beach and offer facilities along the shore. 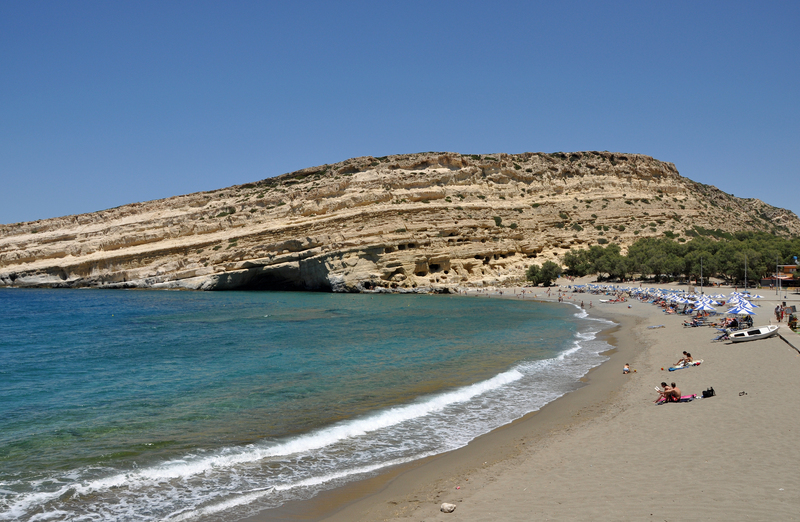 Use our Matala vacation planner to arrange your visit to Matala beach and other attractions in Matala. A nice piece of Earth in spite of tourism. Always happy to come back. Sunset above the rock direction of Red beach can enjoy. Parking € 2. Restaurants and cafés on the beach and the caves also. Secluded beach almost in the middle of nowhere with clear blue water. Perfect spot to relax away from the crowd. One of the most beautiful beach in create, not overly crowded, best for snorkeling and swimming, A MUST VISIT..! It still has a spirit of wild 60s & 70s. Just relax and dont think about is the toilet close or the sand is to hot. A unique atmosphere in Matala. Once this was a hippie beach, they lived in caves above the beach. Today there are smaller numbers here, but they can be seen in the big cave on the left side of the beach, where they sell handmade leather items. I Love Matala! Every day, we help thousands of travelers plan great vacations. Here are some tips on how to use your Listing Page to attract more travelers to your business - Matala beach. Promote your permanent link - https://www.inspirock.com/greece/matala/matala-beach-a284981415 - on your website, your blog, and social media. When a traveler builds a plan from this page, the itinerary automatically includes Matala beach. This is a great way for travelers looking for a great vacation in your city or country to also experience Matala beach. Promoting your link also lets your audience know that you are featured on a rapidly growing travel site. In addition, the more this page is used, the more we will promote Matala beach to other Inspirock users. For best results, use the customized Trip Planning Widget for Matala beach on your website. It has all the advantages mentioned above, plus users to your site can conveniently access it directly on your site. Visitors to your site will appreciate you offering them help with planning their vacation. Setting this up takes just a few minutes - Click here for instructions.